Pancake is a thin, flat, circular shape of cooked batter made from milk, flour, egg and butter. These are basically cooked on a frying pan or griddle by the help of butter or any oil. Pancakes can be sweet or savory in taste. Pancakes may be served at any time of the day with a variety of toppings or fillings including jam, fruit, syrup, chocolate chips. But in America they are typically considered as breakfast food with butter and maple syrup. Actually the shape and structure of pancakes varies at different parts of world. Particularly in India, there are many version of pancake which varies from their taste to the main ingredient used, but each one has prepared without the use of raising agents. 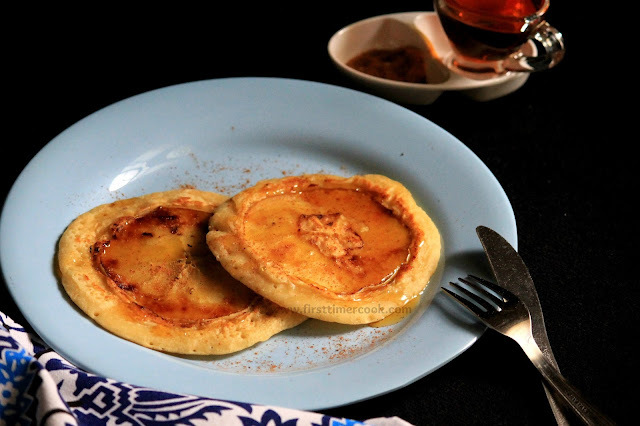 Some Indian pancakes are cheela, dosa, appam, uttapam, patishapta, thalipeeth, malpua etc. In France, a thin pancake named as crepe is cooked on one or both sides to achieve a lace like network of fine bubbles. English pancakes are similar to French crepes and Italian crespelle too. So how about some egg less pancakes to start a day with some apple and cinnamon flavor !!! 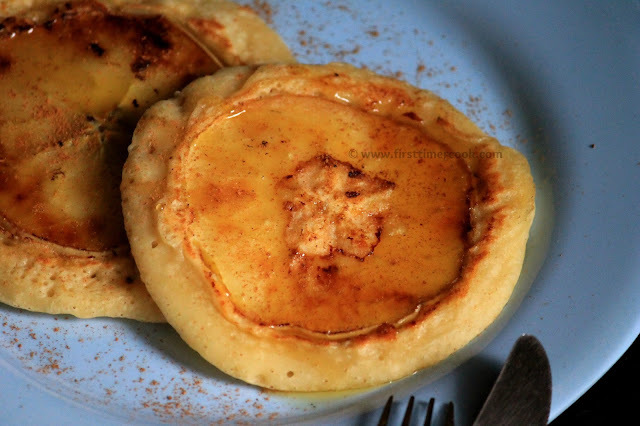 Apple upside down pancake is a soft and fluffy egg less pancake topped with a thin slice of apple and the mild aroma of cinnamon. These are perfect Sunday breakfast option. These egg less pancakes are the easiest things to do in a jiffy and the fluffy and lighter texture of pancakes taste so delicious. Here I have used wheat flour for a healthier option. Baking powder is the rising agent in these egg less pancake. Just thinly slice the apple through the core and place over the pancake before flipping. 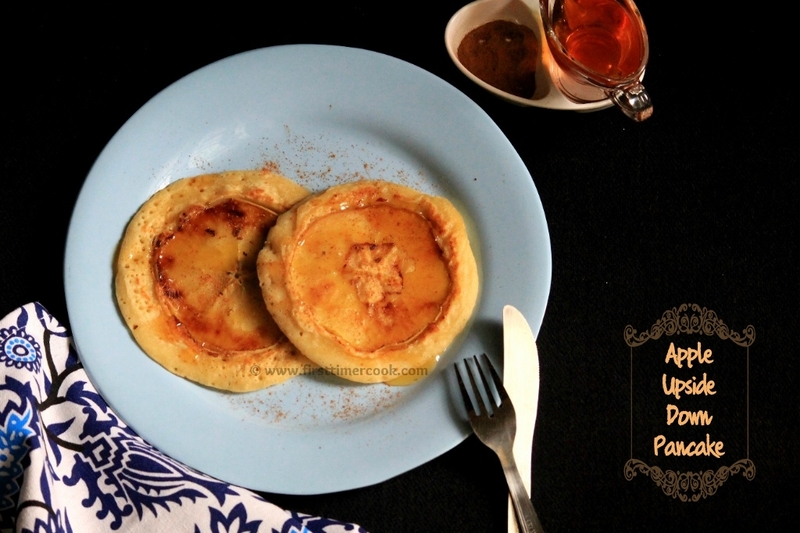 The apple upside down pancake is much kids friendly as well as healthier than the traditional pancakes. 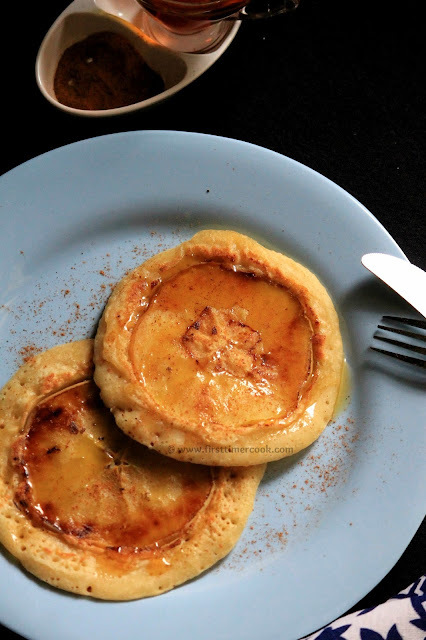 While serving, cinnamon powder may be sprinkled over pancakes for that extra flavor of cinnamon. These are served by drizzling honey or maple syrup on top. So below is the details method of preparation of these easy, soft, floppy and delicious egg less apple upside down pancake. Take the apple and rinse well. Thinly slice the apple through the core, that means horizontal slices. Soak all the apple slices in salty water (combination for salty water is 1/8 tsp salt per 1 cup water) and keep aside. In a mixing bowl, take wheat flour, baking powder, cinnamon powder, sugar and salt. Mix well. Next add milk, water, oil, vanilla essence and melted butter. Using a hand whisk, gently mix everything. Keep aside and allow to rest for 10 minutes. Heat a nonstick pan. When the pan is heated enough, then simmer and grease the pan with butter. Pour 1 ladle full of batter (around 4 tbsp) and allow the batter to spread on its own. When bubbles start to form on top, then immediately place an apple slice (take out from salty water and rinse in normal water before putting on the pancake). Cook for 1 minute more. Then carefully flip the pancake with a spatula and cook the other side until golden brown. Transfer to the serving platter, drizzle honey, sprinkle some cinnamon powder if you want and serve as a healthy breakfast ! Quantity of sugar depends upon the sweetness of pancakes you desire. Always use fresh baking powder for best result. Do not over beat the batter. The consistency of batter should be thick, but pour-able. The quantity of milk is based on the flour, you may adjust up to 1-2 tbsp milk more. Pancake cooked in low heat comes out so nicely. 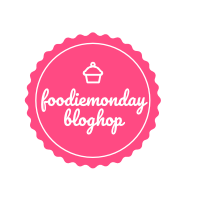 This 'Eggless Apple Upside Down Pancake' recipe is contributed for 117th Foodie Monday Blog Hop where the theme is 'PANCAKE'. Such an innovative share Sasmita ! Sasmita these pancakes look so inviting. Love your idea of using apple roundels to create the upside down pancakes. I've bookmarked the recipe to try out later. Fabulous Recipe Sasmita.You are Innovative. These are so gorgeous. I am bookmarking this ! !